If Nashua Schools have a delayed opening, all morning programs are canceled. If Nashua Schools are closed, the Senior Center is closed. 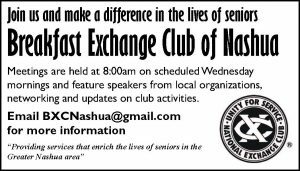 The Nashua Senior Activity Center is a participant in the Amazon Services LLC Associates Program, an affiliate advertising program designed to provide a means for sites to earn advertising fees by advertising and linking to amazon.com. Information pertaining to the Travel policy, registration, cancellation, deposits, etc., may be found in the Center’s Travel Office.